If you think your child has an ear infection, take them to your family doctor. What does the inside of the ear look like? Ear pain and concerns about hearing are one of the most common reasons parents take their young children to the doctor. The medical name for an ear infection is 'otitis media'. Ear infections are very common in babies and young children who are more likely to develop them than older children and adults. 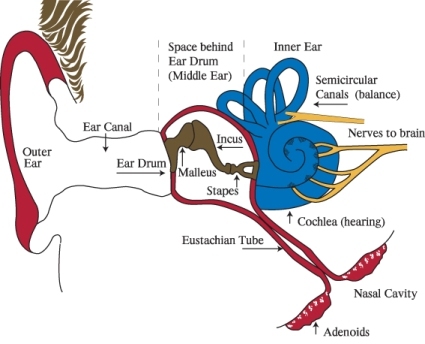 This is because their eustachian tubes (connecting the middle ear to the back of the nose) don't function as well as in older children and adults - the tubes are smaller, shorter and flatter (more horizontal). As children grow older, their eustachian tubes work better and they get fewer colds. As a result, they outgrow the tendency to have ear infections at around 7 years of age. But, some children may have problems beyond this age. What puts my child at risk of getting ear infections? There is no clear evidence that allergy causes ear infections. Can I do anything to prevent ear infections in my child? The pain from an ear infection comes on rapidly and doesn't last long. It usually wears off within 24 hours. Older children will complain of significant ear pain and may have a fever. They may also feel unwell and complain of reduced hearing in the affected ear. In babies and younger children, sometimes the only sign of an ear infection is a fever. Sometimes pus will burst through the eardrum (see the diagram at right). The pus looks like snot coming out of the ear. When the eardrum bursts, children often feel better as the pressure causing the pain is suddenly released. 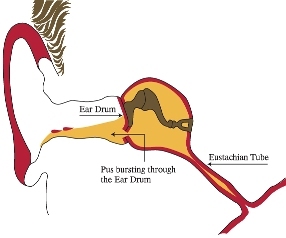 The burst eardrum usually heals without treatment or future problems. See your family doctor if this happens. Can you catch middle ear infections? Ear infections cannot be passed on from one person to another, but the cold or other infection which caused them can. Your family doctor will ask questions about your child's recent and past health and examine your child's ears. To do this they will use an instrument called an otoscope to look at your child's ear canal and eardrum. An otoscope contains both a small powerful light and a low power magnifying lens. Most infants and children do not like having their ears examined. To make it easier, your doctor will probably encourage you to hold your child on your lap and hug their arms and body while your doctor looks inside your child's ear. Checking your child's ears should not be painful. Make sure to hold your child securely. If your child moves during this examination it can be painful for them and make it more difficult to examine their ears both now and in the future. After an ear infection, your child may have fluid behind their eardrum (effusion) which can last several weeks to months. This may cause your child to have a continuing feeling of discomfort in their ears. It is more a dull, abnormal feeling than a nasty, sharp pain. 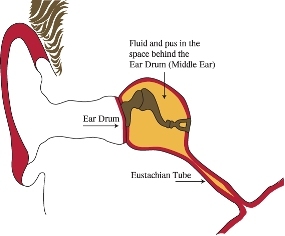 The fluid also causes a short-term decrease in hearing in that ear. See the glue ear page. Regular pain relief is important to help your child feel more comfortable. Paracetamol and/or ibuprofen can help reduce pain, and also lower fever which can make your child feel better. You must follow the dosage instructions on the bottle. It is dangerous to give more than the recommended dose. Your family doctor or pharmacist can advise you on the right dose of pain relief medicine for your child. How can I care for my child with an ear infection at home? There is no evidence that decongestant medicines (including nose sprays) and antihistamines are of any benefit in the treatment of acute ear infections and they can have unwanted side-effects so they should not be used. When should I seek help for my child with an ear infection? The symptoms of ear infections also happen in other illnesses. For this reason, if you suspect your child has an ear infection, take them to your family doctor. Your doctor will examine your child to see if an ear infection (or another problem) is the cause of your child's symptoms. Once an ear infection is diagnosed, your child should start to improve within 24 to 48 hours. If the symptoms are no better or are getting worse, or you are worried about your child, take them back to your family doctor. Always take your child to your family doctor for an ear check 4 to 6 weeks after any ear infection, to make sure the ear fluid has gone. Always take your child to your family doctor for an ear check after any ear infection, to make sure the ear fluid has gone. Go to your doctor again 4 to 6 weeks after the ear infection. If your child keeps getting frequent ear infections, they may need to see an ENT (ear, nose and throat) specialist to consider grommets. See 'Grommets (tympanostomy or ventilation tubes)'. Are there any long-term complications from ear infections? Most children outgrow ear infections and will have perfect, undamaged ears and normal hearing. The fluid that collects behind the eardrum (called an effusion) can last for weeks to months after the pain of an ear infection is over. The fluid is usually gone in 80 percent of children within 12 weeks. A hole in the eardrum (eardrum perforation) can result from the build-up of pus. In most cases, this is a small hole that heals quickly (in hours to days). In a small number of children, the perforation can become long-lasting (chronic) with fluid leaking from the ear. Sometimes an operation to repair the perforation may be necessary but usually not before the age of 8. Starship Foundation and the Paediatric Society of New Zealand acknowledge the cooperation of Procare Health Ltd in the development of this content. Procare Health Ltd provides GP (general practice) services in the greater Auckland area. Thank you to Dr Peter Allen for allowing reproduction of artwork from his book 'Understanding ear infections'. For more information about the programme and the importance of screening for your baby. 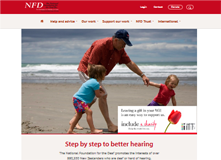 The National Foundation for the Deaf promotes the rights, interests and welfare of New Zealanders with hearing loss. This page last reviewed 18 September 2018.